From the catwalks of the world to the wardrobes and homes of the rich and famous, runs a thread woven from the noble South African fibre: Mohair. The fleece of the Angora goat, Mohair dates back thousands of years to the Tibetan Himalayas, from where the Angora originated. 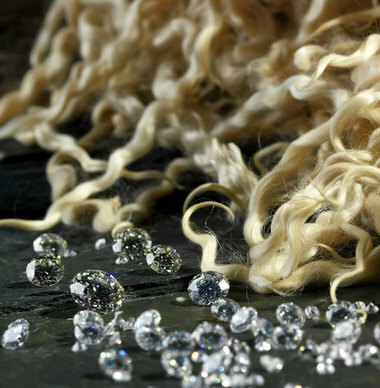 Mohair is known worldwide as ‘the noble fibre’ or ‘the diamond fibre’. Its exclusive qualities – lustre, resilience and colour reflection have been its success, and the South African Mohair industry has grown into the global leader; producing the world’s best Mohair. In the pursuit of perfection the fleece has been refined through consistently high breeding standards and meticulous genetic selection. Angora goats thrive in the Karoo, with its combination of hot, dry summers, cold winters and semi desert vegetation. This combination of best practice farming and the best environment for Angora goats has set South Africa apart from the rest of the world. South African Mohair is globally acknowledged as one of the finest natural fibres available. Angora goats are shorn twice a year and are not harmed in any way during the process. The added beauty of Mohair is that it’s a renewable, natural resource; providing a sustainable production chain between animal and human, while contributing to the long-term prosperity of the Karoo region. Today, Mohair is one of the world’s most exclusive natural fibres, with two centuries of refinement by the South African Mohair industry behind it. The founding of the Mohair industry in South Africa was a stroke of good fortune, after the Sultan of Turkey sent twelve infertile Angora rams and one ewe to South Africa in 1838. Unknown to the Sultan, the ewe was pregnant and gave birth to a ram kid, thus establishing the Angora breeding stock in South Africa. These beautiful, gentle animals ultimately found their way to the Karoo region of South Africa’s Eastern Cape, where great flocks of Angoras are now farmed. Lustre: The fibre’s natural lustre give garments a silky sheen. It’s the ideal garment to wear day or night. Lightweight: Mohair is luxuriously lightweight and renowned for its versatility: cool in summer and warm in winter. Climate control: Mohair breathes, absorbing and releasing atmospheric moisture and controlling its own ‘climate’ to ensure optimal comfort. Durability: Because of its pliability, Mohair is rated as one of the world’s most durable natural fibres. Crease resistant: Products made from Mohair have an innate elasticity, which ensures they hold its shape. Flame- Retardant: Mohair is inherently flame resistant. To download the Stucken Group's Sustainable Manufacturing Report click here. Copyright © Stucken Group. Website Design by Perfect Circle.